Unless otherwise noted, the following are required for creating AWS DataSync. 4 virtual processors assigned to the VM. 80 GB of disk space for installation of VM image and system data. For tasks that will transfer up to 20 million files: 32 GB of RAM assigned to the VM. For tasks that will transfer more than 20 million files: 64 GB of RAM assigned to the VM. You run DataSync on-premises as a virtual machine (VM). VMware ESXi Hypervisor (version 6.0 or 6.5 or 6.7) – A free version of VMware is available on the VMware website. You also need a VMware vSphere client to connect to the host. When VMware ends general support for an ESXi hypervisor version, DataSync will end support for that version as well. For information about VMware's supported hypervisor versions, see the VMware Lifecycle Product Matrix documentation. The agent VM requires access to the following endpoints to communicate with AWS. If you use a firewall or router to filter or limit network traffic, you must configure your firewall and router to allow these service endpoints for outbound communication to AWS. The following endpoints are required by DataSync for ongoing file transfers. DataSync requires the following ports for its operation. 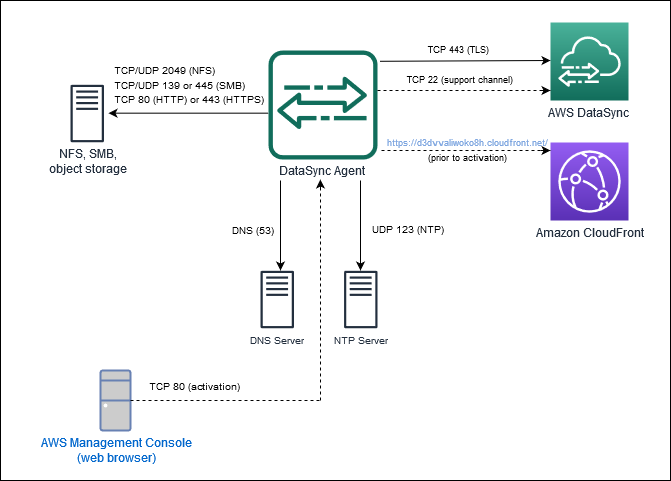 For communication from DataSync VM to the AWS service endpoint. For information about regions and service endpoints, see AWS Regions and Endpoints. By local systems to obtain the agent activation key. Port 80 is used only during activation of the agent. After successful activation, DataSync closes the agent's port 80. DataSync VM doesn't require port 80 to be publicly accessible. The required level of access to port 80 depends on your network configuration. For communication between DataSync VM and the DNS server. Allows AWS Support to access your DataSync to help you with troubleshooting DataSync issues. You don't need this port open for normal operation, but it is required for troubleshooting. By local systems to synchronize VM time to the host time. By DataSync VM to mount a source NFS file system. Following is an illustration of the ports required by DataSync.